Please volunteer to help. Contact president@siskiyouvelo.org to find out what you can do. The next board meeting will be held on May 1, 6:30 PM, at Creekside Estates Community Center, 4601 Pacific Highway, Phoenix. Topics to be discussed include club budget, upcoming social activities, club outreach efforts at local events, and revisions to the club’s administrative budget. All members are welcome to attend. The League of American Bicyclists has reported that new legislation has been introduced in the Senate to increase funding under the Transportation Alternatives program (TAP) which apportions federal funds to state governments for bicycle and pedestrian facilities, Safe Routes to School projects, and recreational trails. Specifically, the bill would make several changes in keeping with recent Federal Highway Transportation funds. The changes to TA would enable local project delivery to be implemented more efficiently and effectively, giving constituents the biggest payoff on the federal investment in TA. The bill will allow states additional necessary flexibility, including the ability to use up to five percent of TA funds for technical and engineering assistance. Technical assistance is critical to strengthen local governments’ capacity to submit strong project applications and implement awards. Other changes would help all communities participate and benefit from the program, including expanding eligibility for smaller Metropolitan Planning Organizations. Learn more about S.1098 here and take a moment to ask your senators to support the bill that will make biking and walking better in our community. 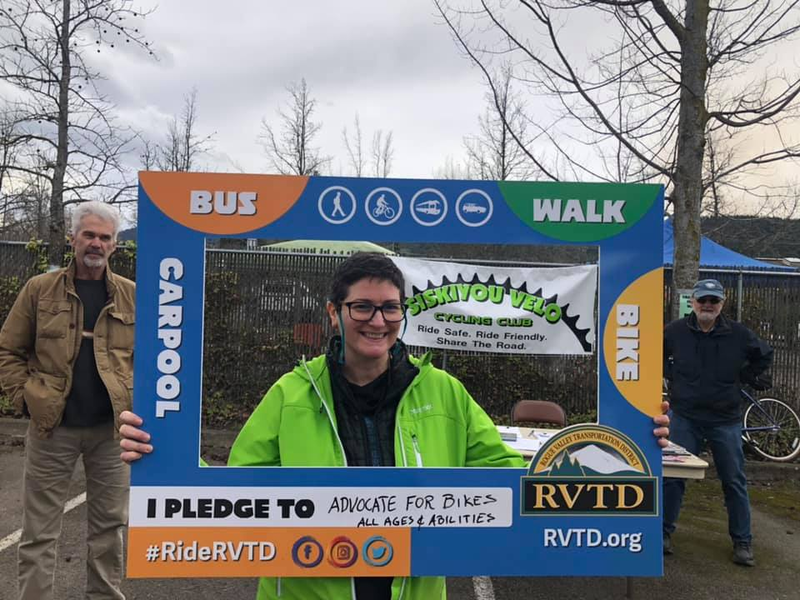 RVTD sponsors Go By Bike Week to celebrate and promote biking as a healthy, affordable, and fun mode of transportation. We hope you will join us in celebrating Go By Bike Week. You can participate by simply taking the pledge to bike more and drive less. Join us for one of our community events, participate in our Bike Month Bingo, and share your photos on social media for chances to win prizes! 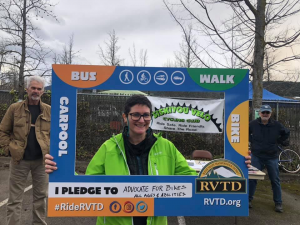 One of the community events is Ride With Leaders – Join local transportation and policy leaders on the annual Ride With Leaders bike ride on Friday, May 17, 2019. Starting at Common Block at 3 pm, the group ride will feature a relaxed 11-mile tour of city and county roads in the Medford area. Hosted by Jackson County Bicycle Committee and led at a mellow pace, there will be a few pauses along the way to demonstrate existing street-level bicycle facilities and access to the Bear Creek Greenway. A route detour for those riders who prefer a shorter tour will also be included. The tour culminates at Common Block around 5 pm where participants can socialize over food and refreshments. Riders should practice safe and courteous riding and comply with traffic laws. Bring your own bike and helmet. The Club was well represented at the Ashland Bike Swap. Members shared information about the Club’s rides, social events, bike handling and safety information, offered sign-ups for future bike ed courses, and shared the status of the Club’s current advocacy efforts. 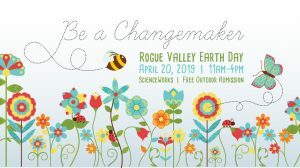 Please consider volunteering for a future community event. Learn more HERE. Ann Smith, center, with Matt Walker, left, Peter Currer, right, and Gary Shaff, not pictured had a delightful time visiting with many of the region’s bicyclist in attendance. Hope to see you there next year?